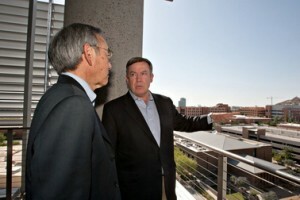 Energy research at Arizona State University was the focus of a visit by U.S. Energy Secretary Steven Chu on May 15. Chu, who was in the Valley of the Sun to help launch the second phase of the Solar Phoenix program, stopped by the university’s Tempe campus to meet with ASU President Michael M. Crow, LightWorks director Gary Dirks and a number of scientists engaged in DOE funded research. Among the scientists who briefed Chu on DOE-sponsored projects were Christiana Honsberg, a professor in the School of Electrical, Computer and Energy Engineering, part of ASU’s Ira A. Fulton Schools of Engineering, and Cody Friesen, an associate professor in the School for Engineering of Matter, Transport and Energy.